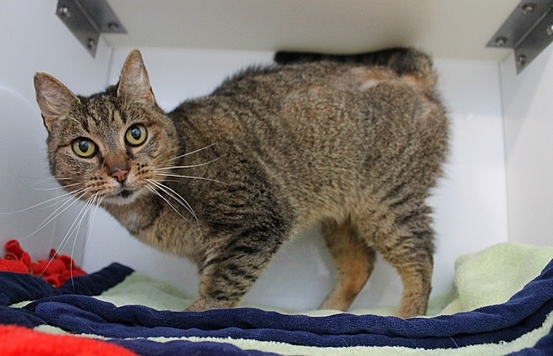 My name is Myrtle and I am a sweet and petite delightful 10-year-old lady cat with lots of love to give! I’ve lived happily among other cats, kids, and dogs during my last 10 years so I know I’ll be a great fit for any family. The nice people here at Pixie have already provided me with a dental and now that my mouth is feeling all better I’m ready to go home! I’m a quiet girl who absolutely loves lap time and will roll around on my back and purr, purr, purr the day away whenever people show me attention. Did I mention how small I am? I’m only 6.7 pounds! I’m just a compact little package of joy and I can’t wait to meet you so we can become best friends. Are you looking for a kitty like me? Come to Petco Unleashed on NW 23rd and Burnside and say hello! I can’t wait! I come to you spayed, vaccinated, and micro-chipped (with recent dental already done) for an adoption fee of $80.